ello BitInvestor, It's been a very long while we published another review and that's due to the fact that we promised not to put investors cash or hard earned money to risk and for that we promised to bring you HYIPs that agrees to provide at least 10% insurance for all our investors funds. We're a top leader in HYIP investments for over a year now; our techniques are unique with complete tutorials and support from a robust team. The best part about BitInvestors Club is that these HYIPs are not our main investment programs or services, we only provide them to help starters raise enough funds, help professional investors make more money. With an active team of over 150 investors in our club who has at least $500 in their portfolios any company can trust us for a possible partnership. 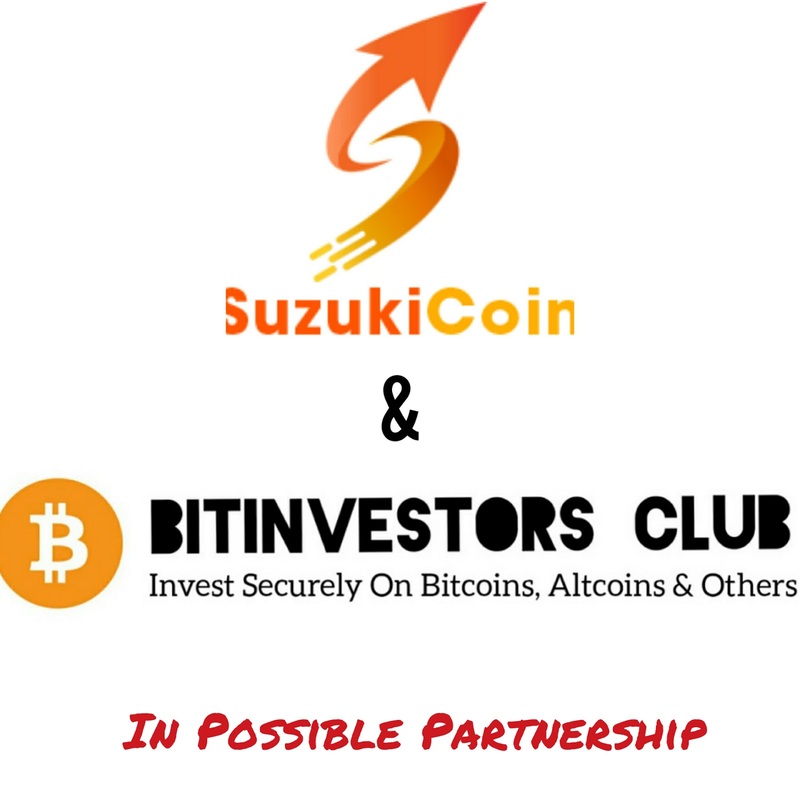 BitInvestors Club has been in sessions with the admin and CEO of Suzuki Coin (Suzukicoin.net) Satoro Suzuki who's into crypto trading, forex trading e.t.c.. on a whatsapp chat, trying to secure our investors before dropping a review here on our blog. 1. $200 as startup insurance funds for our investors. 2. $100 for logistics and promotions which we'll want to be preserved in the form of investment with the company. 3. Suzuki Coin gives a massive 20% in referral profits therefore I and my team has agreed that 15% from whatever acquired from a referral is stored in form of insurance for that investor aside what Suzuki Coin will be providing as insurance. 2. $200 of insurance money should be paid out to the team because its for protecting our investors incase of unforseen circumstances. 3. Contract with Suzuki Coin Will Be For A Month, And if Suzuki Coin Ltd sees no results we'll return investment and insurance and discontinue contract. 4. Our team will require ad banners for promotions. 5. We also want a representative status for affiliates, this will help us save up to 20% insurance for each investor. 6. Our reviews, videos and articles can be added on the Suzuki Coin site to help in promotions and reputation building. 7. Insurance amount will be increased gradually with more investors investing their funds. Note that Suzuki Coin has investment offers paying up to 3% daily. And minimum investment is $50 which will earn you 2% ($1) daily. Any investor can participate on the Suzuki Coin program, it's open to everyone. For anonymous investors, we'll still save 10% of your investment for insurance for you. Insurance covers investors who haven't recovered their capital in returns or profits. E.g: if you invest $3000 and earn 3% daily, and you've been on the program for two months which means you've recovered your investment and made profits, we'll only give you 15% of your investment incase anything goes wrong for club members and 10% for anonymous investors. BitInvestors Club, will provide more details to this once deal is sealed and funds transferred successfully. Once all processes are secured, investors can now invest funds, for the time being, air your opinions. BitInvestors Club Cares, also know that we don't run any HYIP, we're only helping investors and this shouldn't be as a basis for investment. Read our disclaimer for more! 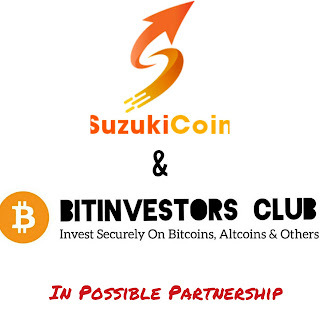 The deal between BitInvestors Club and Suzuki Coin LTD was successful; We got $200 in insurance, $100 in investment plus more deals to come in the nearest future. BitInvestors Club will be insuring 10% of all investors funds (investors on our team or with our affiliate link). This insurance is paid out 2 days after your investment is received; We do so because we don't want to hold investors insurance money, Once we receive funds, we pay investors out immediately. Note that our insurance is different from the company's insurance. Well Get more details on the review HERE and Learn how to invest also.